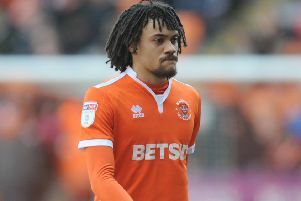 Donervon Daniels says he relished the chance to wear the Blackpool captain’s armband this week. The defender was made skipper in the absence of Jay Spearing, Curtis Tilt and Ollie Turton for Tuesday’s 3-2 win over Accrington Stanley in the Checkatrade Trophy. The armband appeared to spur Daniels on, the centre-back taking responsibility and barking out orders to his team-mates. The 24-year-old said: “I’ve got a relationship with this squad and I feel I’ve got a lot of respect from the staff and players. That win over Stanley was the Seasiders’ third on the bounce but wasn’t enough to see them through to the knockout stages. But it continued Pool’s impressive response to three straight defeats against Fleetwood Town, Arsenal and Bristol Rovers.Since then, Terry McPhillips’ men have seen off Gillingham 1-0, progressed to the FA Cup second round with a win at Exeter City and beaten Accrington in a five-goal thriller. Daniels said after Tuesday’s win: “We’ve picked up some good results recently and we picked up the win here, which was what we needed to do. “We put on another solid performance and obviously I was happy to get back on the pitch. “The legs are good. The plan wasn’t to play the full 90 but I could do it, so I felt it was best to do it. “I’m happy to play the 90 minutes and contribute to the team and I felt we did really well, regardless of the late, sloppy goal we conceded. “Accrington came out strong. Fleetwood came out in a similar way but this time we matched them. “They got the first goal but we bounced back and I felt we handled the game really well. Jordan Thompson has been voted fans’ player of the month for October. The Northern Ireland international, who is currently away with his country, polled 63.4 per cent of the votes to take the accolade ahead of Curtis Tilt and Ollie Turton. Thompson has been promoted to Northern Ireland’s senior squad for tonight’s friendly against the Republic of Ireland in Dublin and Sunday’s encounter with Austria. The 21-year-old scored his first two goals for the club last month, having moved to Bloomfield Road from Rangers in the summer. He will be presented with his award when Blackpool host Burton Albion on Saturday week.